If you choose to see Tucson in Southern Arizona from the back of a trusty steed, through the rodeo dust clouds, or from high above the mighty Saguaros, the view won't disappoint. A sophisticated city of 800,000 that feels like a sleepy desert town, Tucson has plenty to offer outdoor enthusiasts, history buffs, urban cowboys, and culture vultures alike. There's never a dull moment in the Old Pueblo when you refresh your memory of some of the forgotten details at the recreation of the gunfight at O.K. Corral or the more recent history during WWII as recounted at the top of Mount Lemmon. 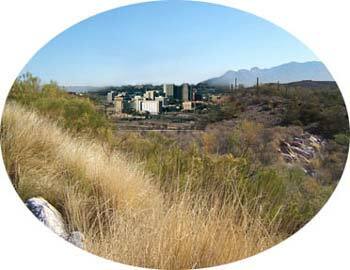 Spread out over a 500-square-mile valley surrounded by five mountain ranges, Tucson is a fresh-air fan's dream. Visitors enjoy hiking and horseback riding among towering saguaro cactuses -- Saguaro National Park has the world's largest concentration of them -- or teeing off on one of the area's many fine golf courses designed by some of the world’s top golfers. Aficionados of the feathered find themselves in bird-watching heaven and everyone is astounded by the Sonoran Desert blooms. Spa lovers are in heaven in Tucson which is home to world class spas including the world famous Canyon Ranch, Miraval Life in Balance and Elizabeth Arden Red Door spas. And Tucson is the only city in the nation to host three Major League Baseball teams for Spring Training in March every year. Even rock hounds from all over the globe know Tucson is home to the world’s largest gem, mineral and fossil show. With its strong Spanish, Mexican, and Native American heritage, Tucson is more than just a pretty space. The Mission San Xavier del Bac, still serves the same Tohono O'Odham Indian community for whom it was established by the Franciscans two and a half centuries ago, and parts of the original Spanish presidio (fortress) flank downtown's mosaic-tiled courthouse. Celebrations such as the annual International Mariachi Festival in downtown Tucson attest to a continuing influence from south of the border (Mexico is only 64 miles away). The Wild West never died in Tucson; it just became a lot more fun. Hollywood allowed folks around the world to enjoy the action in towns like Tombstone without the danger of getting shot. Old Tucson Studios, where some of the west's most famous legends were captured on celluloid, offers simulated shoot-'em-ups and western entertainment shows. City slickers mingle with cowboys at guest ranches, and country and western dance bars. Huge annual rodeos feature some of the swiftest steer-roping around. Although lively nightspots are easy to find, Tucson is also ideal for folks who are happy just to gaze at the stars after dark. Ordinances against "light pollution," designed to aid visibility at the five world-class observatories in the area, ensure that the views of the heavens are optimal for even streetside astronomers. Tucson is a jumping-off point for many other terrific Southern Arizona day trips. Within easy driving distance are the old west mining towns of Tombstone, Bisbee, Douglas, and Ajo; the Arizona vineyards around Sonoita and Patagonia; the Native American art collection of the Amerind Foundation; Kitt Peak National Observatory, part of the Tohono O'Odham Indian reservation; the unusual rock formations of Chiricahua National Monument and much more. Come visit the Tucson zoo, and have a wild time. Meet the more than 400 animals—rhinos, elephants, anteaters, polar bears, lions, and many more in naturalistic settings! Adventure in our African, Asian, and South American regions. Conservation, recreation and education for the entire family. Experience the beauty of one of the most unique Southwestern desert canyons on a Sabino Canyon tram ride. Sabino Canyon is a natural desert oasis located in Tucson's Coronado National Forest and is home to spectacular desert landscapes and abundant wildlife.